Last night, I met someone I've wanted to meet for a long time. 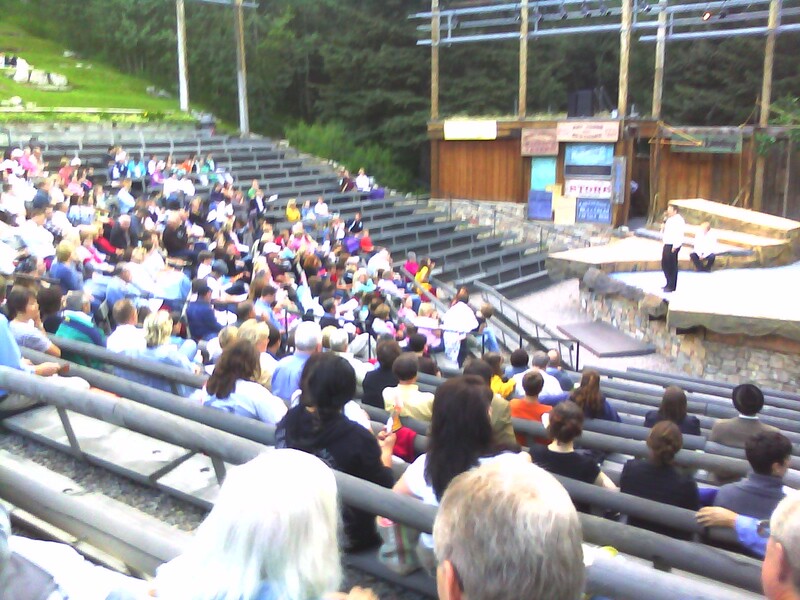 Elder Jeffrey R. Holland was up at Sundance, enjoying Big River with his family. At intermission, I shook his hand and thanked him for the help he has been to me for many years--something I have long wanted to do. If you had told me that last night would be when I'd have this chance, I wouldn't have wanted to believe it. For want of a better description, I imagined if this particular blessing ever came to me, it would be when I was spiritually strong and healthy, not when I was struggling and recovering from quite a bit of personal failure in my life. But even in the dark, I could see heaven's light shining in Elder Holland's eyes. They were so bright, and like the other apostles I've met in my life, I knew he could have looked deep into my soul if he wanted to. Geez Paradox, isn't that weird to you? No, not really. It's nothing compared to what it'll be like to be judged by Christ. As far as I'm concerned, I'm just practicing. But this experience has weighed upon my mind. What are the odds that my roommate would be unable to give away her voucher to anyone except me, and the night I go is when he happens to be there? 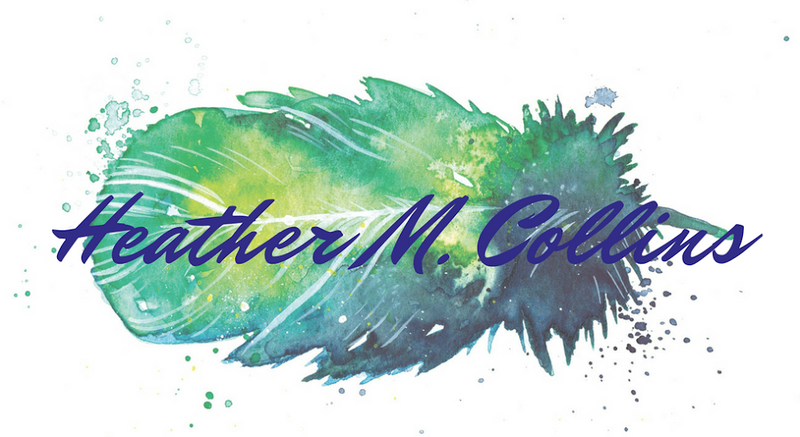 What are the odds that I receive one of the blessings I want most during one of the times I am in spiritual recovery and don't really deserve it? What are the odds that I receive that blessing not because I "deserve" it, not because I want it, but because I need it? Truth be told, I believe that my meeting Elder Holland that night under those circumstances was no accident, no random chance. Heavenly Father knows exactly what it means to me, and why I wanted to thank Elder Holland for what I could never put into words--especially not in that setting. The more I see of God's hand in my life, the more I see that it's impossible for me to deserve in mortality anything He gives me. Sure, I may be obedient to the best of my ability, but I am never going to deserve the greatest blessing He can bestow, the blessing He desires to give me, and will give me if He has His way. And if I ever do receive the immortality and eternal life that are Christ's goals with my life, how could I ever thank Him, or my Heavenly Father? How do you thank someone who looks at you, day after day, as weak as you are, as much as you fail, as much as you struggle to learn, and the only commandment He asks for you never to break is the one where He tells you to "Try again." And even when He doesn't say it with a smile, He never yells or loses His patience with me. Even when I deserve it. Even when I yelled at Him first. My efforts and my gratitude may never compare to what my Savior has given me. That's OK. When He told me to "Be ye therefore perfect, even as your Father which is in heaven is perfect" in Matthew 5: 48, He wasn't demanding for me deliver on my eternal potential in mortality. He doesn't even expect me to deliver on my current potential consistently. We need to understand what Christ was really saying there. If we can't, literally CAN'T be perfect in an instant, Christ wouldn't command us to do it. Obviously He intends for us to be perfected over time. And if we're to be perfected over time, and we're to be perfect like our Father in Heaven, obviously He was perfected over time too. If both the Father of our spirits and the Redeemer of our souls had need to grow, obviously we will too. Some people look upon that as one the most blasphemous thoughts in my religion. Personally, I find it to be the greatest comfort imaginable. Suddenly, God isn't someone waiting to beat me or bless me after my one lifetime of stumbling and struggling with the fact that I'm human. He's a patient Father who knows the way because He's lived it before. He's a testimony to me of my possibility for perfection. In essence, He gives me hope I don't deserve right now because deserving it was never the point. If I deserved it, it wouldn't be hope. Bearing testimony of our Savior is the privilege of my life and the calling of my generation. This blog would be of little or no use to anyone if it ever deviated too far from the miracles and majesty of Jesus Christ. Because of that, I want to deal directly with the topic of Christ now, and share the heart of his gospel message. After Christ performed the powerful miracle of the Atonement and was crucified, we read in John 19: 30 that after he had finished everything he had set out to do in his mortality, "he bowed his head, and gave up the ghost." Leaving this world in perfect submission, He gave his life and his power, bore the burden of our sin and mortality... surrounded by the vilest of hellions and in the face of complete and total despair, Christ performed a perfect sacrifice by offering everything He had ever earned as a payment for our salvation and exaltation. Why? Because He loves us with a perfect love. He loves all life, and believes fundamentally and fiercely that life should continue--that our lives should continue. He believes each and every one of us have purpose, meaning, and something of infinite worth to contribute to the kingdom of God. 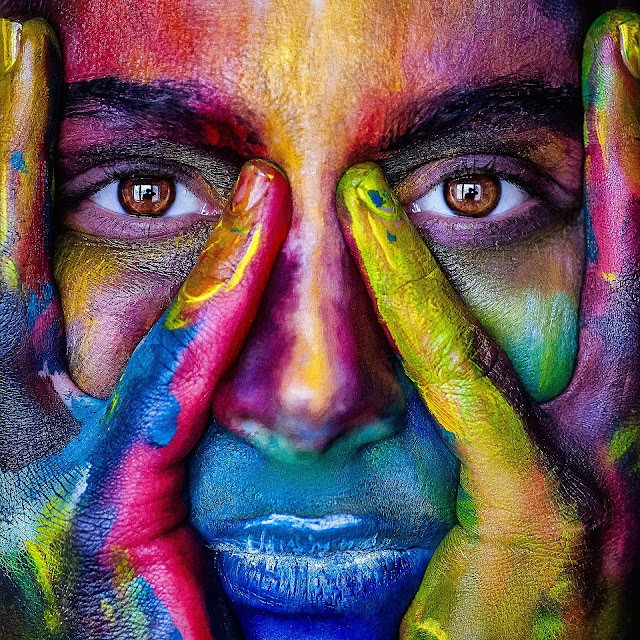 In short, He believes in the divinity that is within all of us, and because He has seen what that divinity can become, He doesn't want us to settle for anything less than the perfect joy of our Father in Heaven. ...there is no flesh that can dwell in the presence of God, save it be through the merits, and mercy, and grace of the Holy Messiah, who layeth down his life according to the flesh, and taketh it again by the power of the Spirit, that he may bring to pass the resurrection of the dead, being the first that should rise. These scriptures tell us that after the Resurrection, Christ no longer had to appear to anyone who did not have faith in Him. As Zion's builders, we have to understand this crucial information to rise to our fullest potential in these latter days. If we want to perform our latter-day mission to build Zion and have Christ return and claim her unto Himself, we must be a body of people who believes completely and lovingly in His Resurrection. In the Church, it's easy to focus so much on the Atonement that we forget that it would have been incomplete without the Resurrection. But we must grow beyond this lack of understanding. Think about it. If Christ had offered to cleanse our lives without ever taking up His life again, we'd still be damned. Death would still hold us captive, halting the plan between birth and rebirth. Our earth could never be exalted and heaven could never come to us. The dead might be redeemed, but they'd never be resurrected. If they were never resurrected, they could never inherit the kingdom and glory of the Father, becoming heirs of salvation with Christ. Zion would never truly come forth, would never fully put on her beautiful garments of priesthood power. (D&C 113: 7-8) We as latter-day servants would not be able to finish the work we were assigned--to build Zion--if it wasn't for the Atonement and Resurrection of Jesus Christ. The house of Israel must be redeemed, and we will bring the gospel to them through our testimonies of Jesus Christ as His ordained servants. Our faith in His Atonement and Resurrection will make it possible for us to regain His presence. In a world that seems to believe more and more fully each day that only seeing is believing, we must remember the power of faith--for this is the only way to appreciate the God of Abraham, Isaac, and Jacob. May we more fully become valiant saints of that testimony together, in the name of Jesus Christ. Amen. 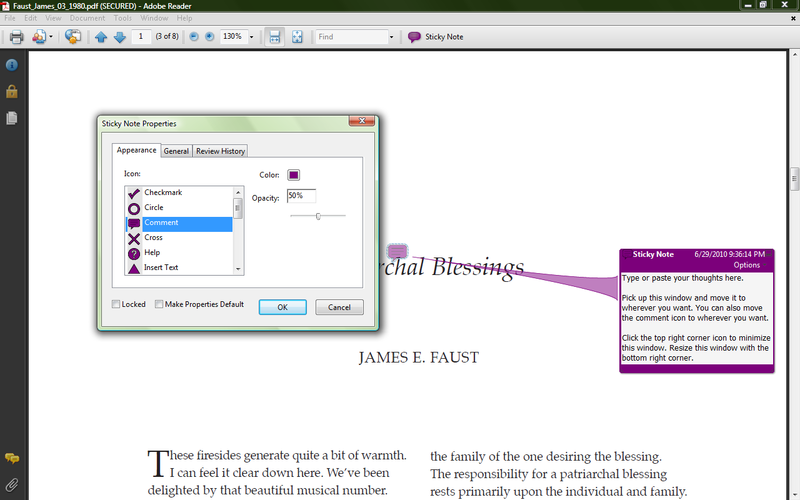 In my previous post on annotation, you'll notice I said I don't annotate my blessing with Microsoft Word. Instead, I use the Comment feature in Adobe Reader. The programs are pretty similar, but I like the less crowded display of Adobe. Please also note that I'm in no way trying to sell Adobe Acrobat. Quite the opposite. I'm trying to help you get what I believe of my own accord to be a superior electronic annotating experience. 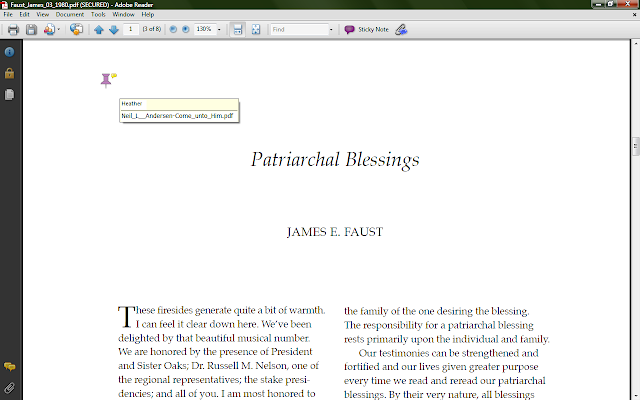 The first step is to get your blessing into a PDF format with comments enabled. 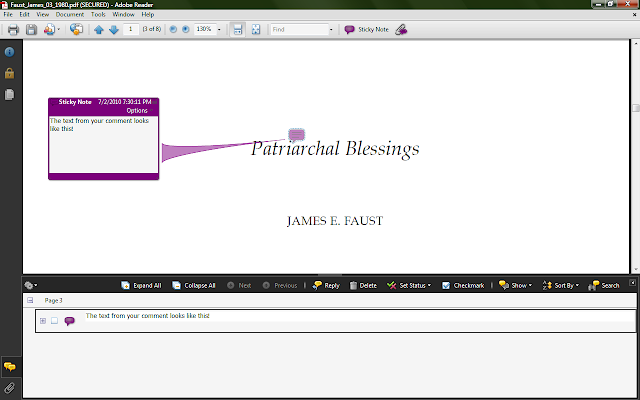 If you've created a PDF of your blessing with any other program--whether through converting to PDF from another document type online, or converting to PDF with your scanner--you will notice that the Comments feature will not be enabled on your document. This feature can only be enabled through a version of Adobe Acrobat. How I got around that is downloading a free trial of Adobe Acrobat Pro (found here, link to the free trial in the right hand column), opening my PDF, and enabling the comments. Once you have Adobe Acrobat, you can create a PDF of your blessing by clicking the Create button, and choosing either a File from your computer, or to create one from your Scanner. Once you have your blessing open in Adobe Acrobat, go to the Comments menu, click on Enable For Commenting In Adobe Reader, then save the document. This will ensure that your document will be enabled for comments in Adobe Reader (which is free) long after you 30 day free trial in Acrobat Pro ends. Personally, I view this as a good time to get out of Acrobat Pro. Considering I don't plan on buying Acrobat Pro and my experience of annotating is going to be largely in Reader once the trial ends, it makes sense to me to learn how to annotate in Reader. This guide will proceed with Reader. If you want to play around with it in Acrobat Pro, you're on your own from here. Find the PDF on your computer and open it with Adobe Reader. This may require you to right-click on the PDF and choose Open With... then click on Adobe Reader. Also note that the small thought bubble that appears is customizable. Right-click on it, go to Properties, and use the options in the box (shown in green above) to change its color, opacity, and shape. You can drag it to anywhere on the document. 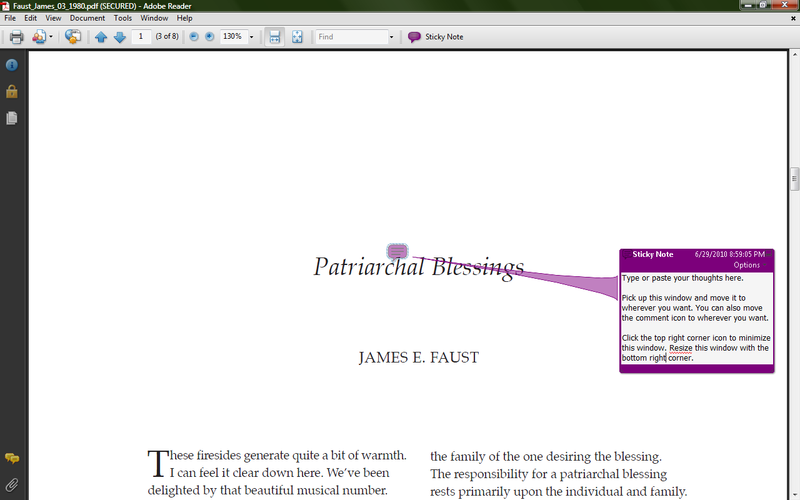 Clicking on it will bring up the larger box (the purple on the right) where you type or paste your annotations. The larger box can be resized and moved. To minimize the larger box, click the top right corner. You will have the option to choose the icon you want. You can right-click on the icon and select Properties to change its color, opacity, and shape as well. Notice the two icons on the bottom left of the screen, the yellow bubbles and paper clips. These bring up windows that show you an index of your comments and attachments, respectively. The interface overall is simpler, and because I have an eye for simplicity I like it better than Microsoft Word. I haven't even begun to explore everything the program can do, however, so have fun with it. "Your patriarchal blessing is yours and yours alone. It may be brief or lengthy, simple or profound. Length and language do not a patriarchal blessing make. It is the Spirit that conveys the true meaning." I testify that every patriarchal blessing has that promise for those who will seek until they find. In the sacred name which seals all blessings to their recipients, even Jesus Christ. Amen.